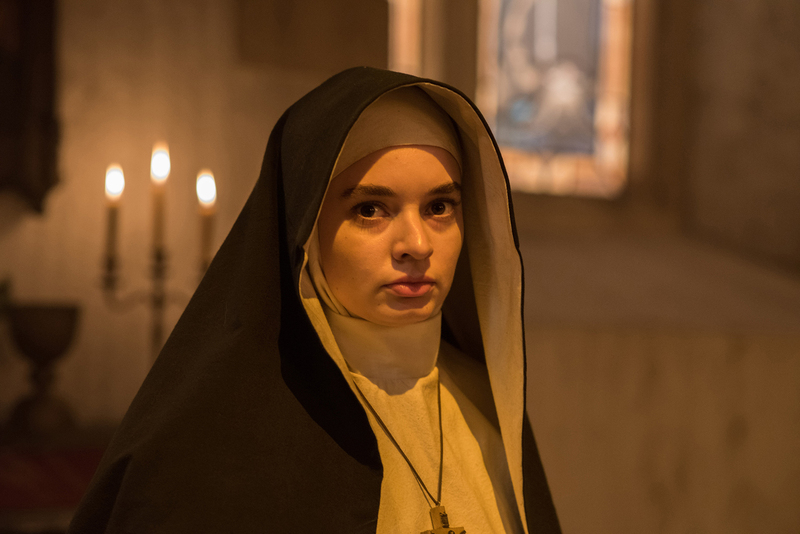 Ingrid Bisu plays Sister Oana in “The Nun,” a horror film released Thursday. Unfortunately, the newest entry into the acclaimed franchise falls down an unholy slippery slope. Director Corin Hardy’s spinoff “The Nun” begins with a cameo of Ed and Lorraine Warren, played by Patrick Wilson and Vera Farmiga, respectively. The characters are based on the real-life paranormal investigators of the same name and the movies in the “Conjuring” franchise are based on their case files. The fictional version of the Warrens has previously appeared in “The Conjuring” and “The Conjuring 2”. Father Burke is a priest sent by the Vatican due to his skills as a “miracle hunter” — a person who investigates religious paranormal activities — while Irene, a novice, is recruited because of a series of visions she had as a young girl about the Virgin Mary, which prove to be key later on in the film. Once they arrive in Romania, Burke and Irene are joined by French-Canadian farmer Maurice “Frenchie” Theriault, played by Jonas Bloquet. At first, Frenchie gives the impression of being a stereotypical comedic side character with his flirty nature and one-liners — but by the end of the film, it becomes clear how important he is to the film and the entire franchise, specifically in the events that lead up to “The Conjuring 2.” Fans may recognize him once they learn of his full name since he is just referred to as Frenchie throughout most of the movie. Frenchie does feel underused throughout most of the movie — when he is utilized, he is usually portrayed as a heroic deus ex machina, arriving at just the right minute, guns blazing. Bloquet — who is best known for his work in the French film “Elle” — successfully adds an air of charm and humor that is much needed in this otherwise empty affair. Admittedly, the film starts off extremely promising with all its gothic, candle-lit hallways and foreboding crow imagery — Edgar Allan Poe would have been extremely proud. This is mostly due to the efforts of Maxime Alexandre and Jennifer Spence, the film’s cinematographer and production designer, respectively. Ironically, the problem arises with the titular demonic “nun,” portrayed by Bonnie Aarons, itself. Somehow it feels as though we are shown the possessed nun too often, yet not enough. The original director of the first two “Conjuring” films — James Wan — successfully used the terrifying yellow-eyed demon — whose actual name is Valak — in “The Conjuring 2” by leaving an air of mystery around it, only giving the audience glimpses until a reveal at the very end. Hardy, on the other hand, exposed Valak all too often throughout, without much of a purpose other than an attempt to freak the audience out with overused jump scares. The movie reaches a point where the story becomes unintentionally comedic when referencing Valak’s history and how to defeat it, specifically with amusing plot lines involving the blood of Christ. This garnered not just a few giggles but rather full-blown laughs from the audience. The absolute ridiculousness of those scenes desensitizes the audience to the demon’s horror. Most of the issues with the film, like absurd plot lines and pacing, arose with the script and direction. Though Hardy did decently with the script he was given, especially the great shots and imagery at the start of the movie, direction can only do so much when the script is subpar. Similarly, the performances were good for what the actors were given to work with. Taissa Farmiga and Bichir are excellent actors with their works in “American Horror Story” and “A Better Life,” respectively. This little glitch in their resumés won’t hurt them in any way. Taissa Farmiga is actually the younger sister of Vera Farmiga. The younger Farmiga holds her own in “The Nun” with her elegant yet unrelenting nature, with her acting style mirroring that of her older sister. This movie will certainly please fans of jump-scare horror, though those looking for more of a paranoia-inducing thrill will have to search elsewhere. It is highly recommended to go with a group of friends just to enliven the experience. However, this movie will seem irrelevant by October in the face of Halloween releases like “Suspiria” and “Halloween” both of which already have great reviews out of the recent fall film festivals in Venice and Toronto, respectively. In the end, “The Nun” doesn’t need good reviews to thrive, considering its domestic opening of more than $50 million. Let’s just hope the next installment in the “The Conjuring” universe — “Annabelle 3,” opening in July of next year — will learn from its predecessor’s mistakes and live up to the rest of the franchise’s films.